Why almost everyone (i.e. the uninformed, politically-ignorant masses) should stay home this November! On that day (November 8th, mark your calendars! ), when Americans are resting from their quadrennial labors of locating a polling place, standing in line, and pushing buttons, pulling levers, filling bubbles, or poking a touch screen, there is a surefire way to start a fight in any bar, church, or bus in the country. Three little words: I don’t vote. Voting is widely thought to be one of the most important things a person can do. But the reasons people give for why they vote (and why everyone else should too) are flawed, unconvincing, and sometimes even dangerous. The case for voting relies on factual errors, misunderstandings about the duties of citizenship, and overinflated perceptions of self-worth. There are some good reasons for some people to vote some of the time. But there are a lot more bad reasons to vote, and the bad ones are more popular. Encouraging more ignorant people to vote is not just pointless, it’s morally wrong. There is no duty to vote, but many people may have a duty not to vote. Boosting turnout among citizens who are young, uneducated, or otherwise less likely to be engaged—the primary targets of get-out-the-vote campaigns—is likely to have the unintended consequence of encouraging people to fail in that duty. None of this is to suggest that the government should test voters or use some other legal means to limit voting. Instead, this is a private moral concern for each voter. If you believe your vote is likely to be ill-informed or that a particular race is likely to yield an unfair, unjust, or otherwise bad outcome, you should refrain from participating in a collectively harmful activity, thus keeping your hands clean. 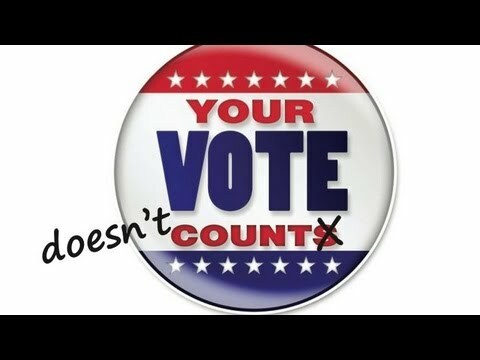 Get-out-the-vote campaigns promote precisely the kind of morally condemnable ignorant voting we should be discouraging. This is the perspective that informs those “Don’t Vote, It Only Encourages the Bastards” bumper stickers. Washing one’s hands of the whole system is a good way to ensure that they remain clean, even when the politicos are dirty. But let us go back to the basics, shall we? Regardless of whom you vote for, your vote will almost certainly not determine the outcome of any public election. I’m not talking about conspiracy theories regarding rigged elections or malfunctioning voting machines—although both of those things have happened and will happen again. I’m not talking about swing states or Supreme Court power grabs or the weirdness of the Electoral College. I’m talking about pure, raw math. In all of American history, a single vote has never determined the outcome of a presidential election. And there are precious few examples of any other elections decided by a single vote. A 2001 National Bureau of Economic Research paper by economists Casey Mulligan and Charles Hunter looked at 56,613 contested congressional and state legislative races dating back to 1898. Of the 40,000 state legislative elections they examined, encompassing about 1 billion votes cast, only seven were decided by a single vote (two were tied). A 1910 Buffalo contest was the lone single-vote victory in a century’s worth of congressional races. In four of the 10 ultra-close campaigns flagged in the paper, further research by the authors turned up evidence that subsequent recounts unearthed margins larger than the official record initially suggested. The numbers just get more ridiculous from there. In a 2012 Economic Inquiry article, Columbia University political scientist Andrew Gelman, statistician Nate Silver, and University of California, Berkeley, economist Aaron Edlin use poll results from the 2008 election cycle to calculate that the chance of a randomly selected vote determining the outcome of a presidential election is about one in 60 million. In a couple of key states, the chance that a random vote will be decisive creeps closer to one in 10 million, which drags voters into the dubious company of people gunning for the Mega-Lotto jackpot. The authors optimistically suggest that even with those terrible odds, you may still choose to vote because “the payoff is the chance to change national policy and improve (one hopes) the lives of hundreds of millions, compared to the alternative if the other candidate were to win.” But how big does that payoff have to be to make voting worthwhile? If you ask a man on the street why rich people are more likely to vote for Republicans, he will probably tell you a story about how the GOP promotes policies that favor businesses and lower the tax burden of the wealthiest people in society. But your sidewalk interlocutor is wrong on two counts. First, rich people are not more likely to vote Republican. (It was a trick question.) Second, study after study, poll after poll, finds that people do not typically vote in ways that align with their personal material interests. The old, for instance, don’t support Social Security in higher numbers than the young. In their seminal 1993 book Decision and Democracy: The Pure Theory of Electoral Preference (Cambridge University Press), University of Virginia philosopher and reason Contributing Editor Loren Lomasky and his co-author, Geoffrey Brennan, offer an alternative theory of what drives voters. But first they offer a methodology for calculating the value of a vote. On their account, the expected utility of a vote is a function of the probability that the vote will be decisive, delivering gains (to the individual or society as a whole) if the preferred candidate wins. The probability of casting the decisive vote decreases slowly as the size of the voting pool gets larger, but it drops dramatically when polls show that one candidate has even a slight lead. Which means that in a presidential election, where the number of voters is about 120 million and one candidate is usually polling a point or two ahead on Election Day, you’re screwed. In his brilliant 2011 book The Ethics of Voting (Princeton University Press), on which I have relied heavily for this article, Georgetown University philosopher Jason Brennan (no relation to Geoffrey Brennan) applied the Lomasky/Brennan method to a hypothetical scenario in which the victory of one candidate would produce additional GDP growth of 0.25 percent in one year. Assuming a very close election where that candidate is leading in the polls only slightly and a random voter has a 50.5 percent chance of casting a ballot for her, the expected value of a vote for that candidate is $4.77 x 10 to the −2,650th power. That’s 2,648 orders of magnitude less than a penny. It’s not hard to beat that offer. Say you plan to sleep for an extra hour instead of voting. Unless you are astonishingly well rested, an hour of sleep is almost certainly worth more to you than an infinitesimal fragment of a penny. Or say you plan to use that time to write an election-related blog post. The expected social payoff of even the lowest-traffic blog post is higher than the payoff from voting. In fact, an alternative activity plan isn’t even necessary: Simply not driving to the polls slightly reduces the chance that you or someone else will die in a car accident on Election Day, which is worth more than your vote can ever hope to be. Those figures reflect 2006 GDP figures and 2004 voting totals, but it almost doesn’t matter what batch of reasonable numbers you plug into the equation. Say you think victory is worth 10 or 100 or 1,000 times more than the roughly $33 billion that 0.25 percent of GDP amounts to. Say the polls show a gap of two percentage points between the candidates. In any plausible scenario, the expected utility of your vote still amounts to approximately bupkes. A vote for a third-party candidate pushes the figure into even more infinitesimal territory. Voters know this on some level. If they truly believed that each person’s vote could be the vote, imagine how they would treat people who disagree with them in early November. Voter suppression happens occasionally, of course. Unscrupulous actors send out flyers that give the wrong date for Election Day or mislead voters about the correct polling place. But if people were operating on the theory that your vote actually counts, far dirtier tricks would be happening everywhere, every day. No individual vote is likely to determine the outcome of an election; nor is it likely to result in a material gain for the voter. Does that mean people who vote are irrational, evil, or stupid? Not necessarily. Or at least not all of them. Mankiw’s argument draws on a 1996 article by economists Timothy Feddersen of Northwestern University and Wolfgang Pesendorfer of Princeton University that cites the phenomenon of “roll off”—people who make it all the way inside the polyester curtains on Election Day and then leave some blanks on their ballots—to illustrate the point that people who believe themselves ill-informed routinely choose not to vote, thereby increasing the quality of voters who actually pull the lever for one side or the other. There is some additional evidence for this claim: Education is one of the two best predictors of voter turnout (the other is age). Better-educated people are much more likely to vote, which suggests that the pool of voters is better informed and more qualified to make election-related judgments than the pool of nonvoters. What Mankiw doesn’t go on to say, perhaps because he fears insulting his readers, is that people aren’t particularly good at knowing whether or not they are well-informed. Many people who follow politics closely hold views that are dangerous and wrong (see George Mason University economist Bryan Caplan’s October 2007 reason cover story “The 4 Boneheaded Biases of Stupid Voters”). Even if everyone who had the slightest suspicion that he was not knowledgeable enough to vote stayed home on Election Day, millions of people would still be casting ill-informed votes. Demographically speaking, if you’re reading this, you’re probably closer to the top than the bottom of the distribution. But you still have very little knowledge of what a politician will do once you send him to Washington. The gap between the promised and real consequences of electing one guy over the other is very difficult to anticipate. Even jaded libertarian types, for instance, were hopeful that President Barack Obama would be better than his predecessor on issues such as civil liberties and the war on drugs. Look how that turned out. You don’t know as much as you think. What if the arguments against voting were so persuasive that everyone stopped voting? This worry, which channels the categorical imperative of 18th-century German philosopher Immanuel Kant, posits that if everyone behaved as the nonvoters do, the whole system would fall apart. A certain minimum level of participation is necessary for elections to appear legitimate. This objection is natural and intuitive. The force behind it is reflected in the Golden Rule and many other moral systems. But there’s no reason to think that one person’s choice not to vote, or even to write a blog article on the-opposition.com making the case against voting, will dramatically alter the behavior of the tens of millions who currently vote. Even if individual voting behavior were universalized, an anti-voting stance could easily be reframed to deal with this narrow hypothetical. One ought not vote, say, unless one’s vote has a nontrivial chance of determining the outcome of an election. If someone found herself in an electorate with zero other voters, she could happily vote (perhaps a write-in of her own name) without violating the general anti-voting principle. For someone who complains about politics, policy, and politicians for a living, the prohibition on complaining by nonvoters strikes close to home. Again, this Election Day cliché is intuitively appealing. If someone invests in an enterprise, we generally recognize that he has more right than an outsider to determine the course of that enterprise. And voting feels like an investment: It takes time and perhaps costs money. In his 1851 book Social Statics, the English radical Herbert Spencer neatly describes the rhetorical jujitsu surrounding voting, consent, and complaint, then demolishes the argument. Say a man votes and his candidate wins. The voter is then “understood to have assented” to the acts of his representative. But what if he voted for the other guy? Well, then, the argument goes, “by taking part in such an election, he tacitly agreed to abide by the decision of the majority.” And what if he abstained? “Why then he cannot justly complain…seeing that he made no protest.” Spencer tidily sums up: “Curiously enough, it seems that he gave his consent in whatever way he acted—whether he said yes, whether he said no, or whether he remained neuter! A rather awkward doctrine this.” Indeed. Whether there is a duty to be civically engaged, to act as a good citizen, is a separate question from the issue of voting. But if such a duty exists, there are many ways to perform it, including (perhaps especially) complaining. According to Mankiw’s argument, the ignorant voter is a far less admirable citizen than the serial-letter-writing Tea Partier who can’t be bothered to show up on Election Day. The right to complain is, mercifully, unrelated to any hypothetical duty to vote. It was ensured, instead, by the Founders, all of whom were extraordinary bellyachers themselves. Ah, now we’re getting somewhere. Maybe people vote not because of what voting can accomplish, but because they like to vote. They like the message that voting sends about who they are (e.g., the kind of person who cares about poverty, or fiscal responsibility, or what his neighbors think). A 2009 survey of 569 professors conducted by philosophers Eric Schwitzgebel of the University of California at Riverside and Josh Rust of Stetson University reinforces this view: 88 percent said they considered voting in public elections to be morally good. In fact, when asked to rank different acts, the professors reported that they considered voting to be on par with regularly donating blood and giving 10 percent of one’s income to charity. Loren Lomasky and Geoffrey Brennan theorize that voting is best understood as an expressive act. Communicating preferences at the ballot box is something people do for its own sake, not a duty they perform or a selfish bid for material gain. So maybe voting is like going to a football game decked out in team colors and cheering as loudly as you can. The chance that your individual voice will sway the outcome of the game is vanishingly small. (Acts can be both instrumental and expressive, of course.) But you are communicating to the other people at the game: I am one of you. I value the system in which we each participate. I am loyal. Bryan Caplan takes the idea a step further. Perhaps, he suggests, voting is more like cheering while watching the same game from your recliner in a darkened living room. If you really try, you can still tell an (ultimately unsatisfying) story about why your actions matter in the rest of the world. After all, your viewership of the game might show up in the television ratings, which boosts the team’s advertising revenue. Of course, you’re probably not a Nielsen household, so you may not show up at all in the metrics that the team’s owners can see. Which leaves solitary game watchers right there with the voters: The main payoff is that you can show up at work the next day and say you did it. So what’s wrong with that? Individual cases of expressive voting in large elections are just as unlikely to affect the outcome of the election as other kinds of voting. But the fact of widespread expressive voting explains why elections are silly season. Politicians offer themselves up as opportunities for expressive voting, as aggregations of easily comprehensible slogans rather than as avatars of sensible policy. Ignorant expressive voters, even rationally ignorant ones, may be committing immoral acts, as Jason Brennan argues. All of which is a pretty steep price for an “I Voted” sticker. Maybe better to stay home and watch the game instead.